He is remembered as a military genius, a tactician without peer. 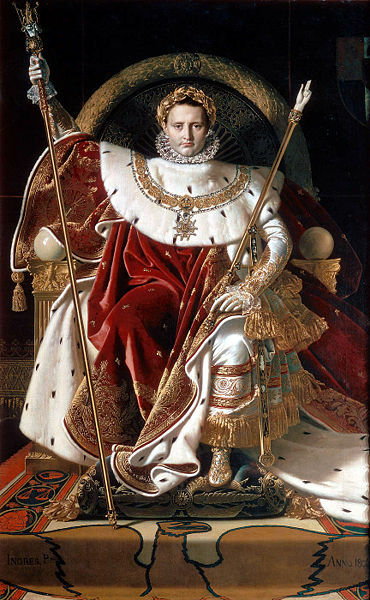 At the age of 35, having just crowned himself the First Emperor of France, he set about conquering all of Europe. 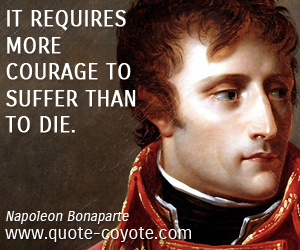 His name was Napoleon Bonaparte and he was, above all else, a master propagandist. He made use of his extraordinary way with words to publish political manifestos, newspapers, and, later, his autobiography. He regularly commissioned portraits and sculptures and was acutely aware of how to present himself in the best light. Even when he made moves to crown himself Emperor, he used propaganda and political nouse to convince the populace that it was their idea. 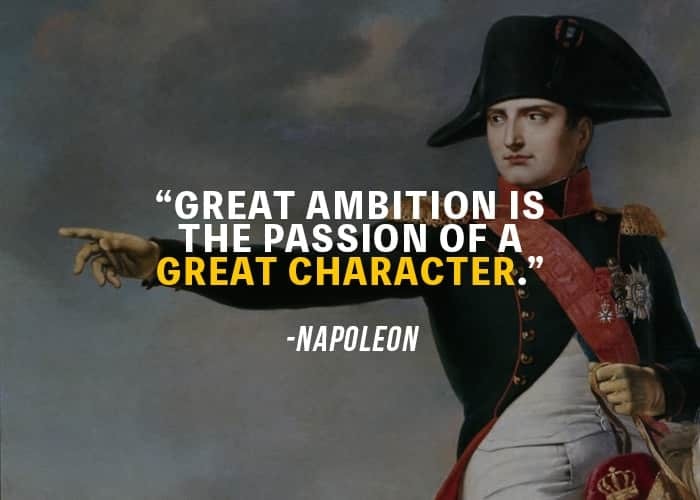 Napoleon has always aroused one of two emotions; hatred or loyalty. Everything around him seemed bigger than life. Yet, he had none of the physical traits that we associate with power – he had extremely pale skin, small delicate hands and a large head set on a short, stout neck. Despite this, his inner self-belief projected the aura of invincibility that made him a natural leader of men. It led him to the dizzying heights of victory – and the crushing despair of defeat. In this week’s Biography, we discover the real Napoleon Bonaparte . . . In the Spring of 1769, the tiny island nation of Corsica was under siege. A hardy band of Corsican patriots were determined to repel the French army that had invaded their land. They never stood a chance. After a year of fighting, death and carnage the rebels were defeated. The survivors trudged through the mountains back to their homes. Among them were Letitzia and Carlo Bonaparte. Letitzia was six months pregnant. It was the Day of the Feast of Assumption, August 15th, 1769 when Letitzia gave birth to her second child. He was named Napoleon. Napoleon’s father, Carlo, gave up the flag of Corsican independence once French victory was assured. He refused to fight on in the mountains with his former patriot hold outs. The 23- year-old university student ingratiated himself to the French overlords and quickly took on the trappings of French privilege. It was something that his second son would never forgive him for, viewing his father as a traitor who had betrayed his countrymen. Carlo entered upon a law practice. Before long he had won election to the Corsican Assembly. He became accepted among the elite of Corsican society and was viewed with favor by the French rulers. Yet, the more successful he became, the more it drove a wedge between he and his second son. In contrast to how he viewed his father, the young Napoleon simply adored his mother. Letitzia was a strong willed, hardy woman. Of her 13 pregnancies, she ended up with 8 children. A harsh disciplinarian, she would tolerate no nonsense. Yet, Napoleon would later reminisce that all of his success in life was due to the training that he had received at his mother’s knee. Napoleon set foot on the French mainland for the first time in the winter of 1778, his father having secured him a position at the prestigious Royal Military College at Brienne in Northern France. He hated it. Accustomed to the warmth of the Mediterranean, the harsh climate shivered him to his bones. To top it off, the skinny, uncoordinated country boy could hardly speak any French. Any one of the facts that he was a scholarship boy, a country bumpkin and a loyal Corsican with a strange accent would have been enough to make him the target of bullies. Yet, somehow, Napoleon accustomed himself to life at Brienne. His stubbornness and tough exterior made him immune to the taunts of his more privileged classmates. Soon they, along with his teachers, lost interest in the sullen, always serious Bonaparte. Napoleon became a loner. At the age of 16, Napoleon began his military apprenticeship as a second lieutenant, training with the country’s most elite artillery unit. He learnt his trade well and developed into a skilled handler of arms and a capable handler of men. Yet, the advancement that he had mapped out for himself was slow in coming. He soon realized that hard work and application were not enough to forge a stellar military career; position and money also played their part. He had neither. By his late teens, Napoleon found himself in a state of frustrated inertia. He knew that he was destined for great things. Yet nothing was happening for him. He was bored to death. What Napoleon needed was a cataclysmic event that would upend the existing order and present him with the opportunity to grab hold of and shape the future. Little did he know that it was waiting just around the corner. On July 14, 1789 Paris erupted in revolution. The spark that unleashed the revolution in all it’s fury occurred when a crowd took over an armory called Hotel des Invalides, grabbed it’s weaponry and stormed the Bastille prison in search of powder and shot. Word spread of the crowd’s success and uprisings began all over France, with granaries and manor houses overrun. The country was in turmoil. Twenty-year-old Napoleon was far from Paris when revolution broke forth. Though not a revolutionary himself, he welcomed the revolt which was shaking the system of privileges which he so despised. After all, it was this very system which had prevented him from attaining to the advancement of rank that he felt was his due. When the French Republic was declared in the Fall of 1792, the ambitious Corsican wanted to play a part. Formulating a plan, he took leave of absence from the army and returned to Corsica, which was now a part of France. He was intent on entering local politics and rising through the ranks until he could assert his influence on the national stage. The Corsican governor, however, rebuffed Napoleon, calling him ‘a big, inexperienced boy’. Napoleon reacted by setting up a power base to oppose the Governor. He attracted a following of young, impetuous cronies. But the establishment proved too strong. Napoleon was forced to flee to the mountains. He and his entire family were labelled traitors and enemies of the fatherland. Setting sail for France in June, 1793, Napoleon was tougher, more steely eyed and more hard skinned as a result of his unhappy experience in Corsica. The experience also caused a mental displacement; no longer a Corsican he was now thoroughly French. That France, however, was going to have to be molded to make it worthy of him. Napoleon returned to the army as an artillery captain. He was quickly ordered to Toulon, a city of 28,000 which had broken into open rebellion. The citizens of this southern port city had thrown their port open to the British. It was the French artillery’s job to prevent the British from gaining a foothold – and to subjugate the rebels. The problem was that the British were defending the city from their ships’ cannons. Napoleon knew that he had been presented with the opportunity that could transform his destiny. Aristocratic officers had fled France, leaving a vacuum that Napoleon was all too eager to fill. All he had to do was prove himself. On his command, guns and supplies were rushed in from Provence, and his gunners were taught to man them. The regular infantry were intensely retrained under Bonaparte’s direct supervision. He also began to display flashes of the charisma which would forge an unbreakable loyalty within his ranks. On December 17, he personally led the assault of Fort Eguilette. His bravery and cunning were immediately apparent. Throwing himself into the fray, he fought with fury. Unlike most commanders, Napoleon led from the front. A horse was shot from under him and an enemy bayonet slashed him in the thigh. Yet, he continued to attack and his forces quickly overcame the resistance. Within hours, 10 British ships had been destroyed and those that remained were in retreat. The local people were subjugated. It was a stunning victory for Napoleon, one which led to a promotion to Brigadier General. In the spring of 1795, Napoleon visited Paris, his ambition burning brighter than ever. While there, he was charged with subjugating the Parisian mobs by any means necessary. He jumped at the opportunity, gathering cannon and musket to equip his poorly armed force. He set his guns up inside the Tuileries in positions that made it impregnable. When the attack came, Napoleon commanded his men to unleash a merciless hail of fire upon them. Waiting until he could see the whites of their eyes, he sent a barrage of grapeshot that decimated the Parisian mob. “The enemy attacked us. We killed a great many of them. Now, all is quiet. I could not be happier,” Bonaparte wrote to his brother. Napoleon was triumphant. Within a month he had been made a full general. At just 26 years of age he was the Commander of the Army of the Interior. As a reward for his success against the Parisian mobs, Napoleon was given command of the French army in Italy. There he was charged with defeating France’s enemies, the Austrians, along with their Italian allies, and push them back over the Alps. This was his first opportunity to fight on foreign soil and Napoleon was determined to capitalize on the opportunity. Prior to his arrival, Napoleon’s generals had already written him off as a no account upstart with allusions of grandeur. When Bonaparte arrived in the flesh, his generals quickly realized their mistake. They had vastly underestimated their new commander. He quickly put them in their place. For nearly two years their incompetence had seen the French forces stagnating in the Alps with nothing to show for it but a general sense of apathy and discontent. As the generals but their lips, Napoleon addressed the troops . . . The men were enraptured by their new leader. Smiling and laughing in their midst, he was unlike anything they had seen before. He picked up their spirits and made them believe in themselves. Infusing them with passion, he began molding them into a formidable fighting force. Meanwhile, the other European powers had become very nervous about what was going on in France. The execution of their king and queen led to fears that the French experiment in democracy would spread and threaten their own kingdoms. This led them to quickly move against the new French government. This led to a series of wars between France and most of the major European powers. Napoleon built his army into the most efficient conquering force on the European mainland. Over the next three years he brought stunning victories not only in Italy, but as far as Austria and parts of North Africa. His North African invasion was actually a move against Britain, which used Egypt as a trading route. Though he failed to bring Egypt under Control, Napoleon was greeted as a hero on his return to Paris in 1799. Yet, he faced a nation in turmoil. The government had no money, the Austrians and the Russians were threatening to invade and some people even wanted to bring back the royal family. Rumors of a coup were rife. Napoleon commanding the charge on Acre. Circa 1799, painter unknown. With the people and the army behind him, Napoleon took charge of the Grand Assembly, installing a new government that was to be headed by three provisional Consuls. One of those three men was Napoleon Bonaparte himself. And it was he who everyone knew was going to wield the power. Immediately Napoleon took control. He adroitly sidelined the other two Consuls, personally rewriting the constitution to make himself First Consul. At 30 years of age, Napoleon Bonaparte had risen from his humble Corsican background to become the most powerful man in France. As the absolute central power in France, Napoleon had inherited a nation that had limped from one failed attempt to replace the rule of monarchy to another. For many people, the conditions they found themselves in at the dawn of the 19th century were worse than before the Revolution. They looked to Napoleon to save them from their despair. First, though, he had to save them from the Austrians. The Austrians had regrouped and gained back most of the land that Napoleon had secured during the Italian campaign. The Archduke, Francis II, was intent on cutting down the Corsican usurper who thought he could do as he pleased. As was his custom, Napoleon decided to take the offensive. In the Spring of 1800 he took his 40,000 strong army across the French Alps. It was a harrowing trek, his men dragging field artillery and provisions up steep, snow covered mountain ranges which towered to a height of 10,500 feet. Men died en route and, as the Grand Armee stumbled down through the St Bernard Pass they were in a state of utter exhaustion. They had made the crossing in just six days. Battle was joined on June 14th. At day’s end 7,000 French men lay dead. The Austrians, who had finally retreated from the field of battle, left 14,000 bodies behind. The totally spent Grand Armee had won again. The Austrians withdrew and, early the next year, signed a peace treaty with Napoleon. Great Britain was the only nation that could stand in Napoleon’s way. He was the supreme ruler of the land mass that was Europe. However, Great Britain had unquestioned command of the seas. Fabulously rich due to her colonial conquests and boasting the greatest navy in the world, Britain decided it was time to halt the rise of the Little General. She declared war on France on May 18, 1803. As it turned out, the French invasion of Great Britain never materialised. 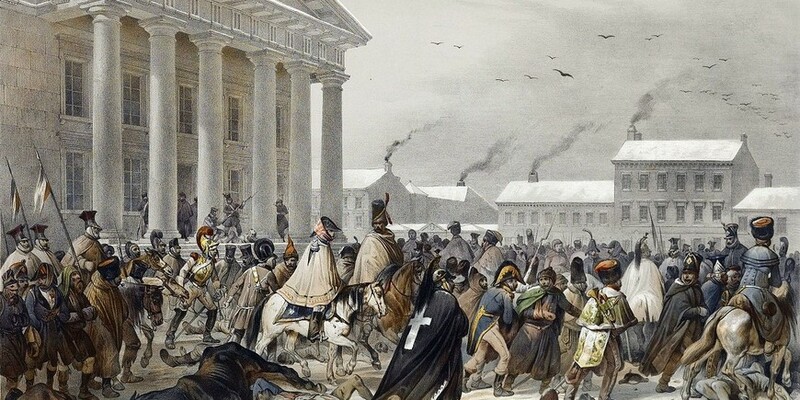 By September, 1805 war with Austria, now fortified by the Russians, was once again a priority. The Grand Armee was being rushed from the Coast to march into the heart of the Austrian Empire. Then, on October 21, the Royal Navy smashed the combine Spanish-British fleet in the Battle of Trafalgar, leaving the French essentially without a navy. The British were safe – for now. In December 2nd, 1804 Napoleon had himself crowned as the first Emperor of the French in a lavish ceremony. In all but name and place it was just like the coronations of the old kings, with one telling difference. Napoleon, the controller of his own fate, placed the crown, all 80 jewel encrusted pounds of it, upon his own head! On December 2nd, 1805 Napoleon found himself again poised for battle against Austria, this time fortified by Russia. It would prove to be the Little General’s greatest victory. He deliberately abandoned a strategic position near the town of Austerlitiz in the Austrian Empire so that his army, which numbered around 68,000, would appear vulnerable. He then weakened his right flank so as to lure the 90,000-strong foe into a trap. They left their center open to counterattack and Napoleon cut their line in two. By 4:30pm the Allies were either dead or far in retreat. The battlefield had fallen silent. The Battle of Austerlitz was over. What had begun as a great allied opportunity to finally defeat and destroy Napoleon Bonaparte had ended, not only in their own defeat, but in catastrophe. The grand victory at Austerlitz was followed up with a 21-day subjugation of Prussia. Over the next five years, victory followed victory as, one by one, the European powers bowed to the dictates of Emperor Napoleon. Only one European nation remained to be brought to heel – Russia. Napoleon and a colossal army crossed the Neman River on June 24th 1812 to intimidate Russia, but it turned out to be the undoing of his empire. The Russians systematically retreated and scorched the earth, which dragged the French deep into their territory. Then, when they did did do battle, it was the bloodiest day of Napoleon’s career. The French entered Moscow a week later, only to find it evacuated. The retreat ended up being even more costly. Soldiers had insufficient clothing for the freezing temperatures of an early winter, disease devastated the ranks, and Russian forces pursued them all the way. A little over a sixth of the 600,000 men who marched into Russia came back. It was a blow from which the Little General would never recover. By now the political map of Europe had changed. 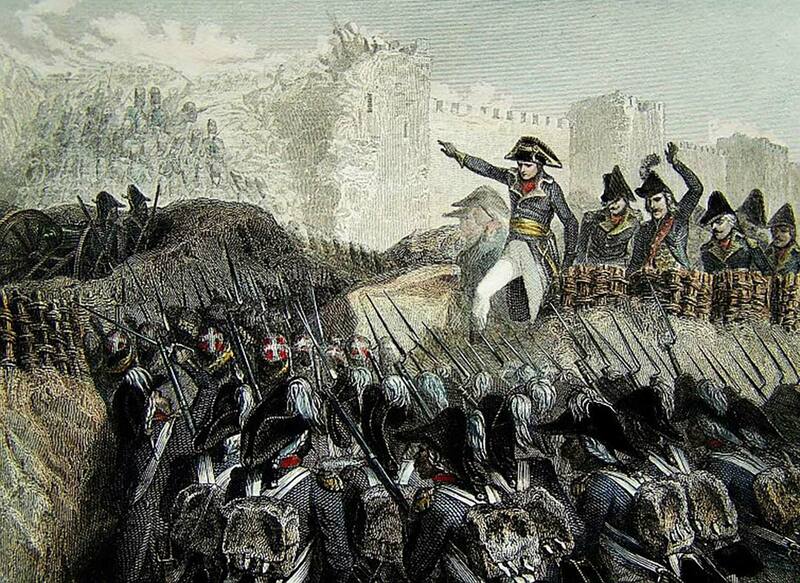 The British, Spanish and Portuguese pushed the French back over the Pyrenees in the peninsular War. A grand coalition was formed, with the decisive victory coming at the Battle of Liepzig in October 1813. Known as the Battle of the Nations, it left 38,000 French dead or wounded and 20,000 captured. Napoleon escaped only to find open hostility back in Paris. The Legislative Assembly, the Senate and even his own generals turned on him. He had no choice but to abdicate, which he did on April 6, 1840. It was agreed to send Napoleon into exile on the Mediterranean island of Elba. After ten months of exile, Napoleon had had enough. Somehow, on the night of February 26, 1815, he managed to sneak past his guards and set sail in a small boat for the mother country. With him were a handful of loyal soldiers. Miraculously, they managed to elude British warships. Stepping foot back on French soil, he fixed his sights on Paris and taking back what had been torn from him. After six days, he and his few men were halted by an infantry regiment with strict orders to detain him. Napoleon, strode ahead of his followers and stood in their midst . . . Soldiers, he declared, if there is one among you who wants to kill his general and emperor, here I am. Print shows Napoleon I seated backwards on a donkey on the road “to Elba” from Fontainebleau; he holds a broken sword in one hand and the donkey’s tail in the other while two drummers follow him playing a farewell(?) march. Includes twelve lines of verse. His charisma had done it again. Rather than rush to take him captive, the massed infantry broke into wild applause. Cheers of “long live the emperor!” filled the air. Suddenly he had an army. As he closed in on Paris, he drew more and more support. In one place after another, troops defected from the Royal army and joined the rebel army. The writing was on the wall. By the time Napoleon rode into Paris, Louis XVIII had fled. Napoleon was back in command. The people welcomed him as a redeemed hero. Across Europe, the Allies were in shock and disbelief. The devil had been unchained. They would have to unite once more to stop him. This time, though, they would have to totally destroy the man, so that there was no coming back. Napoleon was declared an outlaw and a disturber of the tranquility of the world. They massed their armies for attack. The great reckoning was at hand. It would be delivered on a field of rye and clover just outside of a small Belgian town called Waterloo. On June 18th, 72,000 French soldiers faced a 68,000-strong allied force under the Duke of Wellington. While the fighting seemed even, Napoleon made tactical errors, including launching his Imperial Guard too late. His most fatal error was to wait until midday before ordering his initial attack in order to let the muddy ground dry. This gave the Prussian’s time to enter the fray later on. They smashed against his right flank and the battle was lost. Bronze Death Mask of Napoleon I. Modeled in 1821; Cast in 1833. Four days later, Napoleon abdicated again – this time there would be no return. He was packed off to the remote British Colony of Saint Helena. At 46, Napoleon was a man without a future. The man of unstoppable ambition, the man of action, the maker of headlines was confined to reading the newspaper and gardening. He died on May 5th, 1821 likely from stomach cancer. Days before, when he knew that his time was up, he had whispered to one of his guards . . .
To die is nothing. But, to live defeated and without glory is to die every day.